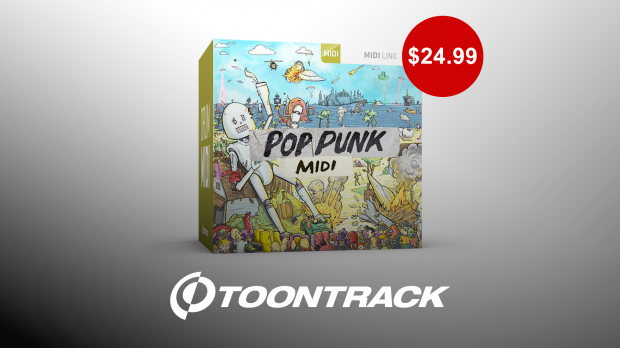 Get Pop Punk MIDI Here ! Since classic acts like Blink-182, Sum 41 and Goldfinger paved the way and literally kicked the doors wide open to main stages and stadiums around the world, the pop punk genre has found itself in a constant evolution. To this day, it continues to produce countless acts setting new standards by the numbers, merging the don’t-give-a-damn attitude of punk with the power of timeless hooks, melody and modern pop production values. In terms of drums, we’re talking both ends of the extremes – from pummeling d-beats and untamed aggression down to laid-back and subtle. Welcome to an all-in, no-holds-barred collection of slick, tight and classy drumming that encompasses the entire range of what pop punk was, is and will be as soon as you get started writing. This entry was posted in DontCrack, Sounds and tagged Cymbals, Drummer, Drums, EZdrummer 2, Kick, MIDI, Pop, Pop Punk, Punk, Snare, Superior Drummer, Toms, Toontrack. Bookmark the permalink.